I probably should not be posting anything at this time. I have severe PMS and am practically incapable of stringing a sentence together. 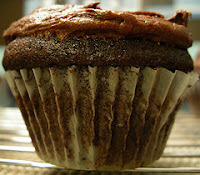 I feel extremely anxious and keep finding myself searching out yummy treats like this decadent cupcake. I keep telling myself if I give in I will undo in 5 minutes what I have worked very hard to do in the last ten days. Which is getting harder to justify. I have exercised everyday, drank tons of water and really tried to watch what I have eaten and NOTHING. I realize my system is in shock. " What the heck? Are you trying to starve yourself? I can hear it speaking to me right now! So I am sure it (my system) is trying to hang onto every pound it possibly can. Will I give in? I don't know. It is quite the inner battle and my double chin is beginning to grow on me, which is leaning me in the "yes" direction. So we shall see. Maybe I will just eat a boiled egg white and go to bed. Devin started his new job yesterday but was really disappointed when the guy decided to give him $2.00 less per hour then initially promised. I think it was kind of a dirty trick and know that Devin is worth far more then that. I am not sure if he is going to stick it out, I admire the fact that he went back for a second day, but at the same time think he might want to move on. I am job hunting as well and honestly trying to do that while PMSing is not the best of experiences. But, on the plus side. I have not burst into tears, sobbing "I'm the worst mother in the world!" So maybe the whole watching what I eat thing is showing positive results after all. But man, what I wouldn't pay to be able to eat that chocolate cupcake with no consequences right now! Oh my, that muffin does look good. I wouldn't be able to say no with or without pms. Do you drink diet drinks? General Food International has a sugar free/fat free mocha coffee. Might help? Might not....ha. Tough news about Devin. He deserves to be treated fairly. He's a good guy and a hard worker. I am headed to the cabinet to find chocolate. I couldn't help but notice that you didn't blog. Does this mean you ate the muffin?